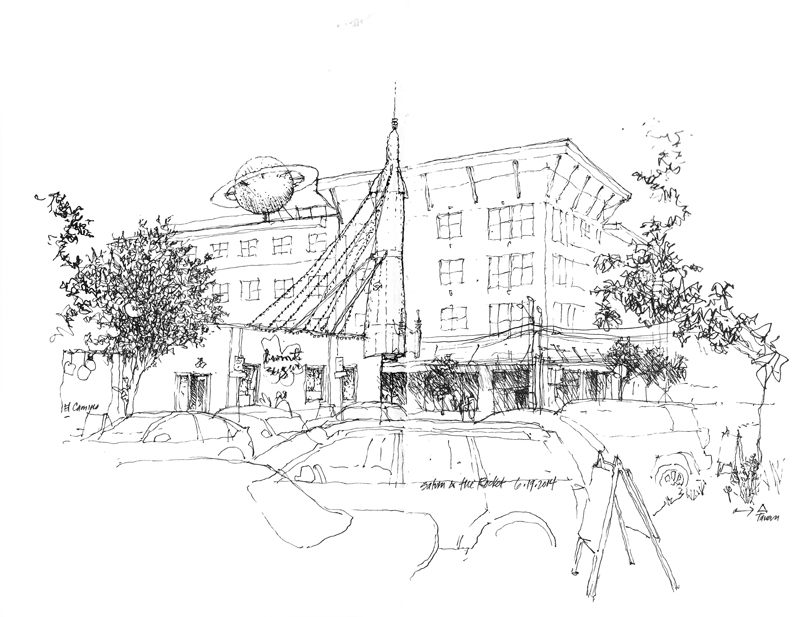 I had previously drawn the Fremont rocket in 2011 but this view looking toward the intersection of Evanston Avenue North and North 35th Street appealed to me because of the way it juxtaposes the Fremont rocket and the relatively new Saturn sculpture. The 12-foot diameter globe sits atop the Saturn Building, which houses office and retail spaces. Solar panels atop the rings collect energy during the day while the planet glows at night. In giving preliminary approval to the installation last year, City Council member Jean Godden said with tongue planted firmly in cheek, “I’m concerned that they don’t have enough artwork. At some point, they may want to add a sun or a star.” Just down the street, there are three more orbs outside the Fedex store but Brian Regan, developer of the Saturn Building, said that they were from another galaxy.